When it comes to identity, The Frau is slowly becoming Die Mom. Or, to sound more professional, The Frau may decide she prefers the title of CMO: Chief Mädchen Officer. But who are we kidding. Once a Frau, always a Frau. As one can imagine, having a baby abroad has opened many new doors for The Frau. From her first Swiss hospital experience where she received homeopathic cheese treatments to her first Kinderkrippe experience where she pondered how “Krippe” rhymes with “Grippe” (especially after her daughter got her first cold last week). 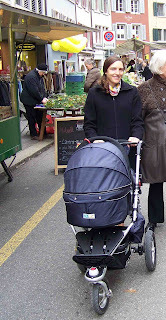 Anyway, if you’d like to read more of The Frau’s observations on Die Motherhood, visit swissinfo.ch this week. And if you have any questions about becoming a parent in Switzerland, feel free to leave a comment. Who knows. maybe The Frau will be inspired to write another Dear Frau column on the topic. She does have a whopping six and a half months of experience, after all. Ha ha, please do another Die Mom column. I am currently 6 months pregnant with my first child and discovering new aspects of Switzerland I never suspected before (mostly paperwork-related though...honestly think twice about having children in Switzerland as foreigners especially if you're not married!). Anyhow, disgressing but my favourite quote was "You can’t wait to make a fortune selling your baby stuff on the Swiss second-hand market. SFr 350 ($385) for a used stroller, anyone?" Well actually I'd say that CHF350 for a second-hand stroller is fairly cheap by Swiss standard, I have come across adverts trying to sell them for CHF 750-1000 for popular branded ones. Are they having a giraffe? Sure, I'll do another Die Mom. It's not hard to find inspiration, ha ha. Good luck with that paperwork. It pretty much never ends. Then there's the birth certificates, passports, birth abroad stuff. It's expensive too. I am so glad my husband LOVES paper work. And he isn't even Swiss! I never had to hassle with that stuff, but he thrived on it. One way you can feel cheerful is that you will be rewarded with a pension for your baby-rearing services. Believe me, that pension check coming in every month makes me feel pretty benevolent towards the Swiss. I had my second daughter in Switzerland and spent 13 years there bringing up kids while my career fell apart, but I am being compensated with actual money in my old age. Do you mean the extra CHF 200/month (well I think the amount varies based on the canton) that gets added to one spouse's paycheck? Yes, that's a pretty nice benefit. I think you get it until they are 16. I wonder how it feels to be a mom in Switzerland. Do they have working moms support group nyc too?